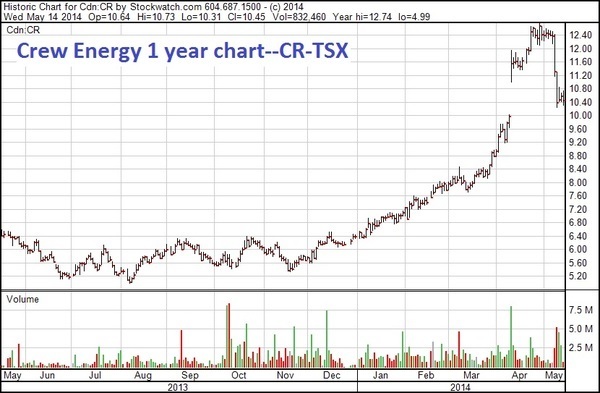 Canadian energy stocks are playing serious catch up to their American cousins this year. And I think that should continue through 2014—Canada is the Best to Invest in energy for the first time in 2-3 years. Last year, everybody’s money was going into US stocks—in almost all industries. Energy was no exception. There wasn’t a lot of love for the Canadian juniors. I made all my money in 2013 in the US—in the first half on refinery stocks, and the second half on ethanol stocks. But 2014 is different. The stocks of junior Canadian producers started pricing in higher gas prices and profitability late last year, and in February exploded up as natgas actually did move up. Lower Canadian dollar—it has touched 88 cents once this year and is hanging around 90 cents. A lower loonie = lower costs and higher cash flows for Canadian producers. This has really helped the light oil producers. 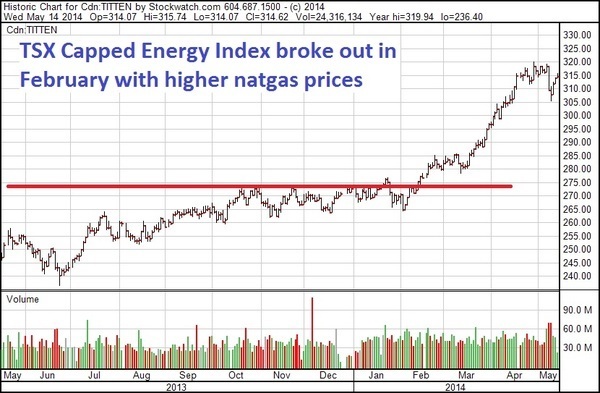 High natural gas prices thanks to the very cold winter. This has changed the psychology of the North American gas market, but even more so in Canada. Ontario’s storage is almost rock bottom empty. Alberta’s is a little better, but there is a lot of work to do. And now, no utility wants to get caught without full storage in case next winter is like this one. Executives will get fired if they don’t have enough gas come December. Canadian natgas stocks didn’t really respond until mid-February when the Prairies had a few weeks of -20 to -40 degree weather. Gas prices started to spike to $8/mcf—and stayed there for a few days. Stocks started to move. The stocks leading the charge up were the old favourites of 3-5 years ago; stocks that used to be $15-$20 but had fallen down to $6 or $8. Painted Pony, Crew Energy, and NuVista would fit that bill. This group of stocks all took off mid-February. 3) The belief that more heavy oil refinery capacity in the US—especially BP’s refinery in Whiting Indiana—will reduce the discount for heavy oil to light oil. Canada has a lot of heavy oil. 4) Rail has done an amazing job getting Canadian oil to market—all over the US and Canada. Southern Pacific (STP-TSX) is now sending rail cars all the way down to the US Gulf Coast from the oilsands. This relates to Point #3 above—the Market no longer sees big blowout discounts for Canadian oil. 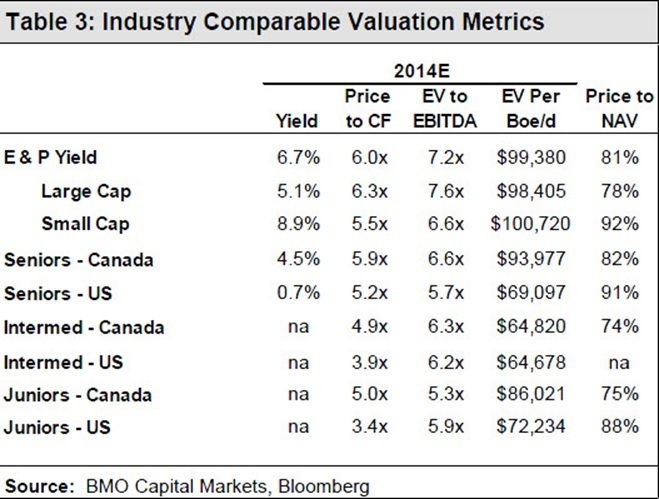 5) US valuations are high—Canada is seen as a discount. Though it was interesting to read recently in the weekly BMO energy report that the discount has narrowed–junior and intermediate valuations between US and Canadian listed stocks are closer now after this big run. To me, the most important ratio is Enterprise Value to EBITDA–that’s what I pay the most attention to. And that shows Canadian juniors as the cheapest stocks on the board. But it still feels like the US is more expensive…likely because of the great formations with multiple payzones that the US has in places like the Permian. Even the big independents like EOG and Pioneer doubled last year, and the successful juniors like Bonanza Creek (BCEI-NYSE), Matador (MTDR-NYSE), Laredo (LPI-NYSE), Goodrich (GDP-NYSE) and others tripled or quadrupled. But most of those stock charts have stalled or declined since last October. And sentiment on the Street is the Canadian energy sector is seeing a lot more international money flow than last year. One Canadian analyst, Geoff Ready of Dundee Securities in Calgary, suggests American investors are “just warming up to the better royalty regime (in Canada). Most Canadian assets reside on crown lands where all three Western Canadian provinces have royalty incentives for horizontal wells. One example of that is the new discovery by Crescent Point (CPG-TSX) along the Saskatchewan-North Dakota border. CPG has successfully produced from the Torquay formation now, which lies just under the Bakken. This formation is called the Three Forks in the USA, and has been drilled extensively. But there are two very different royalty regimes on the play on either side of the border, as Ready says. One other factor I’ve noticed is that the US market is willing to give stocks a HUGE multiple EARLY if they like the play, and then the company has to spend a lot of time backfilling the value into the stock. The US energy juniors have bigger runs sooner–often MUCH bigger runs because they have fewer shares out, but higher debt leverage. They can get up to 11-12x cash flow–BUT, then spend 2-4 years backfilling the value into the stock, in a flat stock chart. Now, I often like expensive stocks—they tend to stay expensive, and cheap stocks tend to stay cheap. Honestly, my biggest winners have been like this. 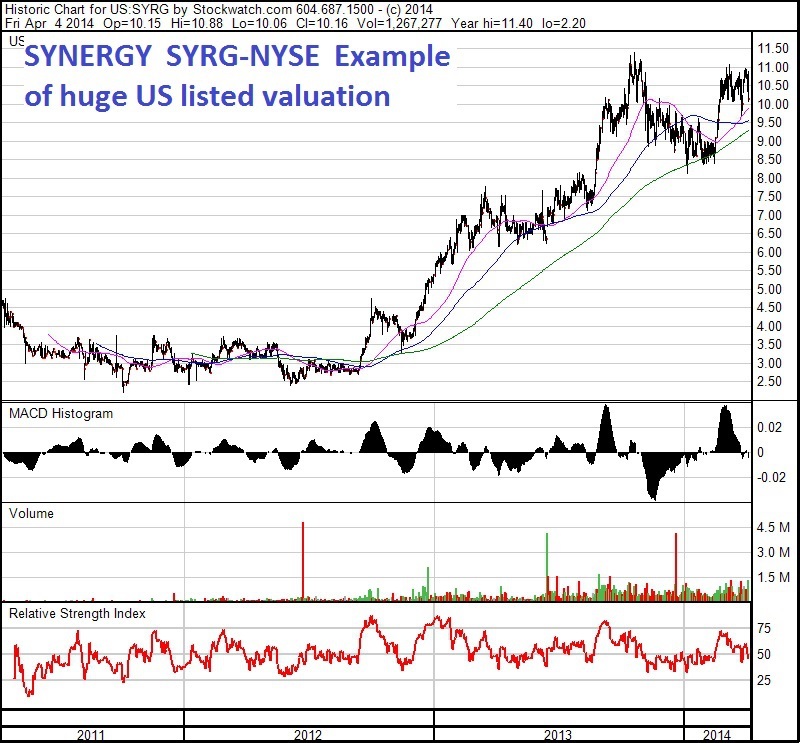 But I couldn’t bring myself to buy Synergy (SYRG-NYSE) at $3 two years ago despite one of my best contacts beating me over the head with the stock. It was always over $175,000 a flowing barrel, and often over $200K. The stock hit wll over $10 recently, and it’s still very expensive. But also, because Yankee investment culture allows their producers to get very leveraged at 4-5x debt to cash flow, it could be argued they don’t have quite the same capital discipline. BusinessWeek just ran a great story on how producers were raising hundreds of millions of dollars, after explaining to investors they have not made money for years and would only return $1 for every $4 they would be about to spend. And as a result, when commodity prices crash, their survival is in doubt more than Canadian stocks. For the first time in two years, my Big Winners are in Canada.